Cinnamon is basically a spice that is acquired from the inner bark of a number of trees from the genus Cinnamon which is used in both sweetened and savoury foods. The flavour of cinnamon is because of vital aromatic oil that makes up 0.5 to 1% of its composition. It is primarily used in cooking for flavouring and condiment material. It is equally suited for the fiery beef curries and the subtle, fragrant rice dishes (biriyanis). It is also widely in use for flavouring tea. 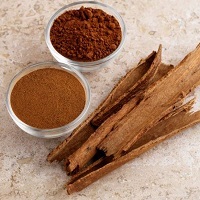 Cinnamon is adulterated with cassia and sawdust.The method of recognition is to distinguish the genuine by smelling as cinnamon has a distinct smell.